Rochester Hills is a beautiful city located within Michigan State. Families here are what make the community a great place to live, work and play. This bountiful backyard has transformed into one that can be enjoyed for many years. 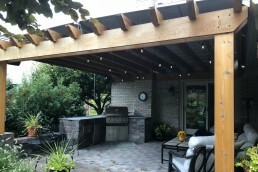 The addition of a ShadeFX retractable roof allows outdoor entertaining to extend well into the seasons. 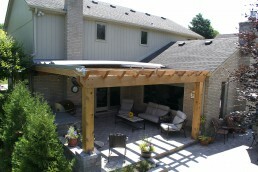 Creating a natural extension of the house, an attached cedar pergola was designed over a stone patio. 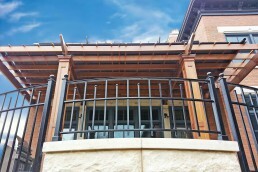 A notch was crafted into the pergola to accommodate the brick chimney, allowing the structure to be flush to the home. Seeking options for rain protection, Rick and Sue Jayroe found ShadeFX. They opted for a low maintenance retractable roof. A trendy and long-term solution, the roof was designed to conform around the chimney. The ShadeFX service team travelled to the welcoming city of Rochester Hills for installation. 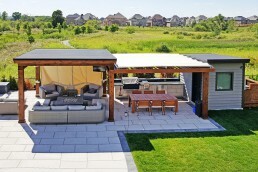 The 16’ x 16’ retractable roof was mounted on the topside of the outdoor seating structure. 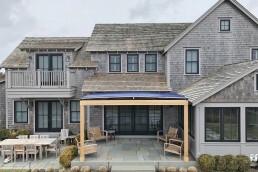 The motorized Sunbrella and polycarbonate top allows homeowners to decorate underneath the pergola as they desire. In this case, they attached speakers and trendy outdoor string lights. “We have really enjoyed the shade this summer and start of the fall. We are loving the outside space and amazed how water resistant the shade is. 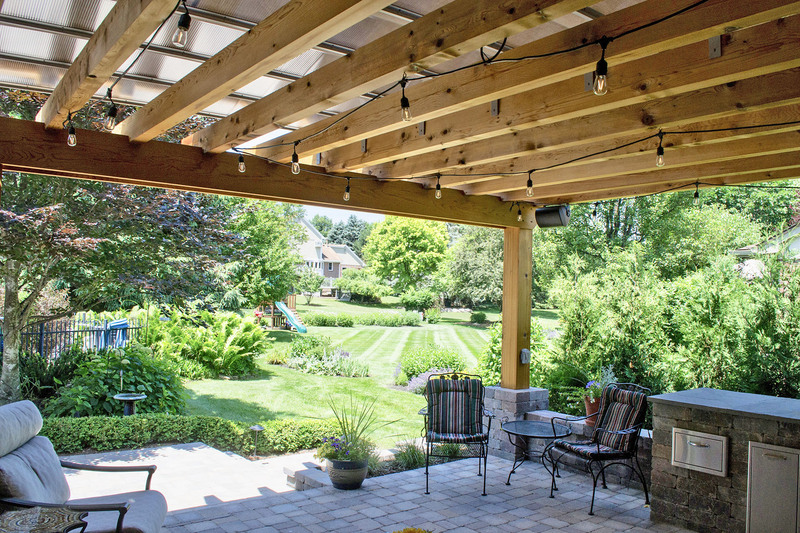 This large pergola accommodates a comfortable seating area and a stylish barbecue station. Coupled with a retractable roof, this area is protected from the sun and keeps dry from the dreary rain. 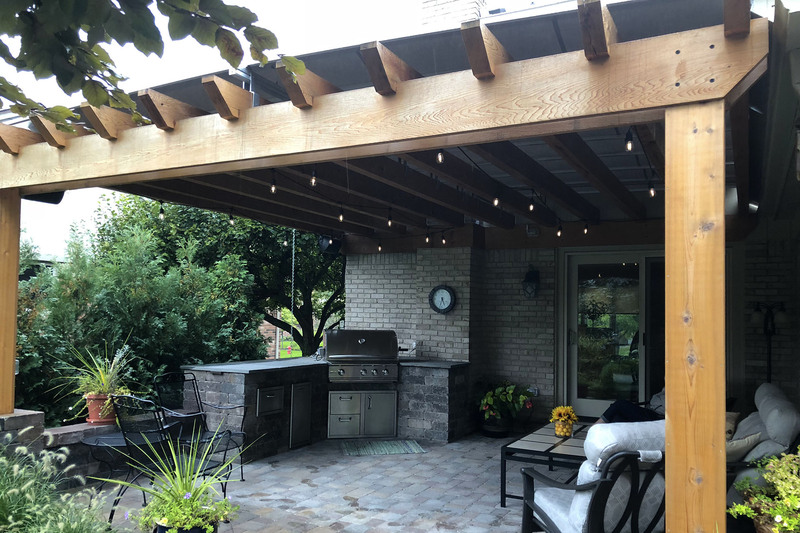 All in all, day or night, rain or sun, spring or fall, this Rochester Hills home extension keeps family and friends gleefully entertained. 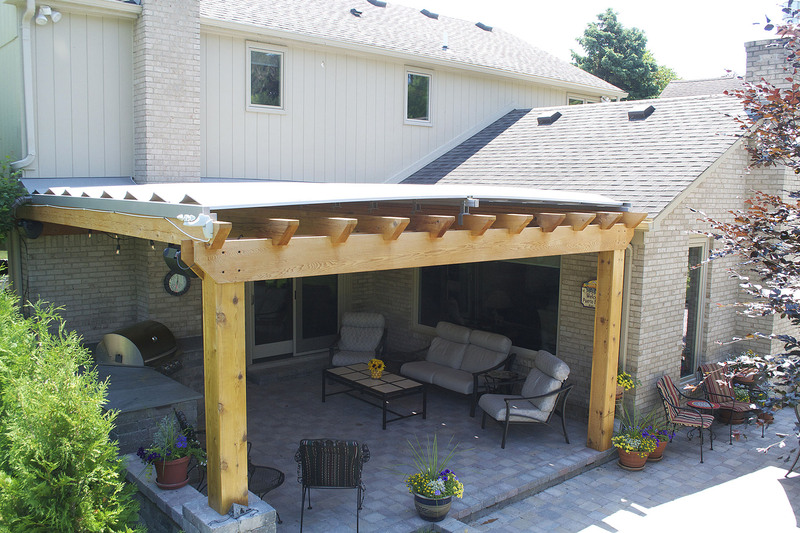 We provide retractable coverage for every structure. Let’s get started on your project. ShadeFX installed a 16’ x 16’ motorized retractable roof using a combination of Sunbrella fabric and Polycarbonate panels. 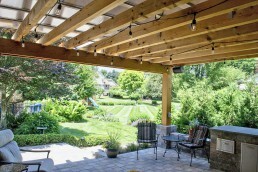 A notch was crafted into the pergola to accommodate the brick chimney, allowing the structure to be flush to the home.